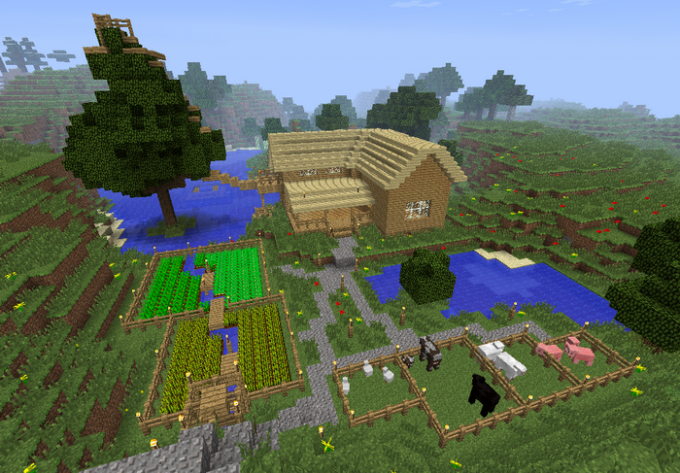 Agriculture in the Minecraft game is one of the easiest ways to provide your character with food. Do arrangement farm or garden immediately after construction of the first housing. In Minecraft there are many useful plants suitable for food. The easiest way to get wheat seeds, which later you can bake bread, but it should be noted that potatoes are much easier to use. However, in the beginning of the game, it is quite difficult to find as a potato can get in the treasure room after killing the zombies or in the village. Wheat seeds can be extracted from grass growing everywhere, it just need to mow with your hands or any tool. Any seeds can be planted exclusively on a bed. To make a bed, you will need a reservoir and a hoe. The bed must be constantly wetted, on a distance of not more than four cells from it needs is a block of water. Thus, the square of nine by nine blocks, only one block of water in the center. But if you just started to play and you have no bucket with which you could transfer the water to the right place, you can have a farm on the banks of the nearest body of water. The hoe can be done in the beginning of the game, for it you will need two sticks and two planks. Open interface workbench, place in the bottom two cells of the vertical center of the two sticks, and in the upper horizontal complete boards two cells of three, using Central. Such a hoe will be enough for the treatment of a sufficient amount of land for the first farm. To get a flower bed with a block of land, click on it, right-click while holding a hoe in his hand. Repeat this procedure until you process the entire desired area. For the first time, you will need to field at least thirty cells of this amount of wheat you can make ten pieces of bread. By making a sufficient number of beds, put in the quick access toolbar and click the seeds in the beds with the right mouse button. Note that all seeds germinate only if you are close to them, so the field must be near the house. In the future, it makes sense to have a farm in a cave under the house. Try to enclose your field fence to aggressive monsters and regular animals don't trample over it. In addition, the fence can be installed in torches, as any plants, except for mushrooms, require a high level of lighting. Note that the seeds of melons and pumpkins should be planted so near Rostock remained empty cage, since that is where will be the fruit once the plant is full grown.